The win, and his team, no doubt lifted Mike Candrea's spirits. Somewhere, Sue Candrea is smiling. Although U.S. softball gave up its first run of the Games, the Americans capped a dominating Olympic performance Monday with a 5-1 win over Australia for their third straight gold. The women, who outscored the field 51-1, dedicated the win to Candrea, their coach's late wife who died a month ago. Hopeful future | Caple: Fantastic four | Real Dream Team? Why is the softball team the true Dream Team? Because coach Mike Candrea pushes them to perfection. Forget about the Mendoza Line -- opponents batted less than .100 against the U.S. in women's softball. Yukiko Ueno pitched the first perfect game in Olympic softball history, leading Japan to a 2-0 win over China on Friday and a spot in the tournament semifinals. Cat Osterman struck out 10 in six innings, Crystl Bustos homered and the Americans completed a perfect run through the preliminary round with a 3-0 win over Taiwan on Friday, setting up a United States-Australia showdown in the semifinals. Lisa Fernandez and the U.S. softball team showed no mercy -- again. Lisa Fernandez pitched a one-hitter as Team USA made it six shutouts in six games with a shortened 7-0 victory Thursday over Greece. Lori Harrigan allowed only a first-inning bunt single and Crystl Bustos homered Tuesday as the Americans posted their fourth straight shutout of these games, 4-0 over China. Jennie Finch pitched a one-hitter with eight strikeouts and Lisa Fernandez went 3-for-4 with a homer as the Americans posted their fifth straight shutout, beating Canada 7-0. After a 0-0 tie forced an extra inning, U.S. softball squeezed out three runs to improve to 3-0 at the Games. Jennie Finch didn't allow a hit in three innings as the United States topped Italy 7-0 in in its tournament opener. Barely a month after his wife's death, U.S. softball coach Mike Candrea is back on the job. Jennie Finch has drawn attention to U.S. softball as the team heads to Greece as the ones to beat. Stacey Nuveman hit a tiebreaking two-run homer in the bottom of the ninth inning to help the U.S. Olympic softball team rally from a three-run deficit to beat a team of All-Stars from the National Pro Fastpitch league 5-3 Tuesday. Lisa Fernandez, starting for the U.S. Olympic softball team in the final game of its "Aiming for Athens" collegiate tour, allowed one hit and struck out six in 4 2/3 innings in an 11-0 victory over UCLA on Sunday. New Zealand became the first country to win three straight world softball championships, beating Canada 9-5 Sunday behind Mark Sorenson's three-run homer. Star softball pitcher Lisa Fernandez was one of four two-time Olympians picked Friday for the U.S. team that will try to win its third straight gold medal in Athens this summer. 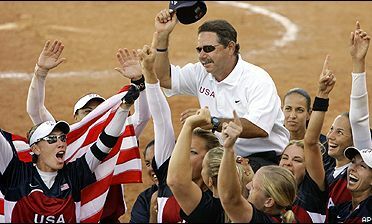 Lisa Fernandez, the pitching ace who sealed U.S. softball victories in the previous two Olympics, is among four two-time gold medal winners on the roster for the 2004 Athens Games.